Exceeds ANSIZ87.1, EN175 and CE Standards. Wearing a welding helmet that is specifically designed to protect the skin and eyes is essential while welding. While traditional helmets offer limited protection, auto darkening welding helmets are more efficient and much safer. 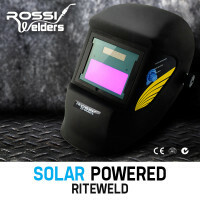 As well as protecting against harmful light emissions, they also change back and forth between dark and light states, making welding tasks more fluent. 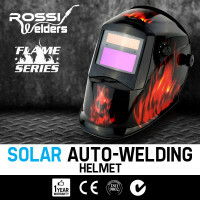 Rossi Welding Helmets are a must have for any handyman, contract welder or tradesman. Equipped with state-of-the-art Optical LCD technology, these helmets are highly efficient and come in a range of styles. As soon as you start welding, your eyes are instantly protected by automatic tinting of the viewing window. 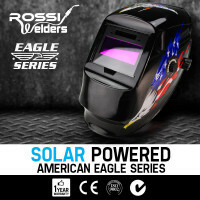 Known for having the industry’s fastest automatic tinting response time, Rossi Welding Helmets instantly protect the eyes from the welding rays and flash with a reaction time of less than 0.0002 milliseconds. Available in various decals and colours, they are affordable, comfortable and very easy to use. 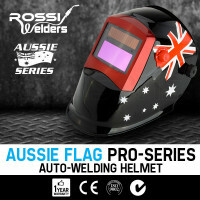 Among the many helmets available in Sydney and other Australian locations, Rossi Welding Helmets are the stand out choice packed with fantastic features. These include the stepless DIN adjustment from 9 to 13, the one-touch headset for a truly comfortable fit and self-charging back-up batteries to eliminate the need for replacing. 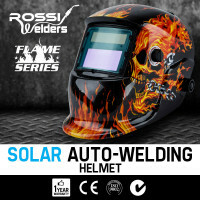 Among the top welding helmets online, Rossi Welding Helmets exceed CE, EN175 and ANSIZ87.1 Standards. 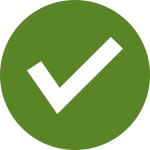 Edisons also offers a full 12-month replacement warranty for complete customer satisfaction. When buying a welding helmet online, be sure to check out the other impressive welding tools and equipment that Edisons has to offer. We also sell affordable, economical and high quality Welding Carts and Welders. 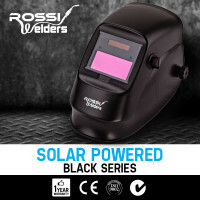 Buy a Rossi Solar Auto Darkening Welding Helmet today and experience total welding power like no other!